Australia is the world’s skin cancer capital. At least two in three Australians will be diagnosed with skin cancer before they turn 70. Exposure to ultraviolet radiation (UVR) from the sun is the major cause of skin cancer. Every year almost half a million Australians are treated for non-melanoma skin cancer, and 450 die from it. Add to this another 10,000 Australians who receive treatment for melanoma. Fortunately, skin cancer is both visible and treatable. The five-year relative survival rate for melanoma for Australian men is 90 per cent and 95 per cent for Australian women. 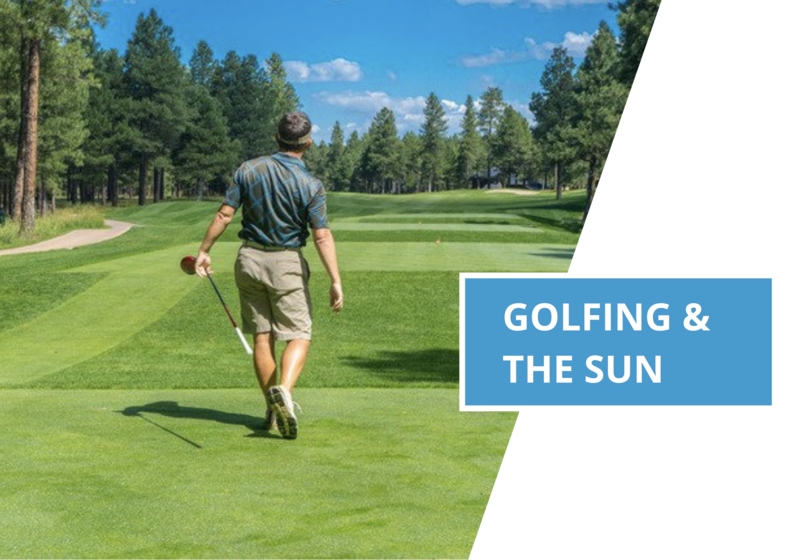 While summer offers the perfect weather for playing golf, it also means golfers are particularly susceptible to damaging UVR (ultraviolet radiation) due to the time they spend in the sun while on the golf course. This can lead to sunburn, skin damage, and even skin cancer. What’s more, the ponds and sand traps featured on most golf courses can reflect harmful ultraviolet radiation back at you, heightening your exposure. So how can golfers stay protected? There are five simple sun safety precautions you can take to protect your skin without compromising your round. Make sunscreen your base camp when it comes to protecting yourself from the effects of the sun when you’re golfing. Use a broad-spectrum (UVA/UVB) sunscreen rated at an SPF of 50+, 30 minutes before you head out onto the course. As you’ll be working up a sweat, go for a sweat-resistant sports formula that won’t run into your eyes. Remember to reapply every two hours, or more often if you find yourself sweating heavily. It’s scorching out there this summer so wherever practicable, schedule your round for either early in the morning before the sun is at its peak or very late in the afternoon around sunset when the sun’s intensity has dropped. Courses often discount late tee-off times so you can help your skin and save your wallet simultaneously! Besides sunscreen, the smartest form of sun safety is covering up. Not all clothing blocks UVR (ultraviolet radiation) so wear sun smart UVR lightweight protective long sleeves and pants. Where possible wear a wide-brimmed hat to protect your neck, face and ears from the sun. This isn’t always practical during play so a baseball cap or a visor are useful substitutes. They remain securely in place while you are playing and provide reasonable coverage for your face. However, remember to slather your neck and ears with sunscreen as these vulnerable spots may still be exposed as you play. Prolonged UVR exposure can carry serious consequences for your eyes. Cataracts are a common form of eye damage. Without intervention, cataracts can result in blindness. Sunglasses are a simple way to protect your eyes and the exposed areas of skin around them. They also reduce glare, improving your visibility when you’re out on the course. Look for a pair that preferably blocks 99 to 100 per cent of UVA and UVB radiation, or that carry a UVR absorption grade of up to 400nm. While trees are rarely your friends on the golf course, they do provide welcome shade. So, give exposed skin a brief rest from the sun’s rays and find a shady tree. There are several options for shade on your average Australian golf course. Similarly, give your skin a much-needed break from dangerous UV rays by fitting an umbrella specially designed for UV protection to your golf bag and opting for a covered golf cart. Both options allow you to cover up between holes. As the chance of beating skin cancer improves significantly if it’s detected and treated early, it’s important you check yourself completely at least once a year and report the first change you notice to your GP. Watch out for any new spots or spots that are changing, bleeding, increasing in size, itching, changing colour or scaling. In selecting the right doctor for you, it’s important you find a doctor who understands your concerns and has the right experience and qualifications. That’s why all our doctors have their profiles listed on our website making it easy to get their background and special interests as well as checking their availability. To book an appointment, simply hop online and select your nearest practice, choose your physician and book a convenient time. Alternatively, call our practice’s number listed on the website. Integrated Medical Solutions Group is a fully accredited, Australian, privately owned and operated network of medical clinics. We’ve been servicing our patients for over 40 years and we are committed to providing comprehensive, patient-centred care. We are dedicated to ensuring our patients enjoy the highest level of quality, affordable and accessible care. Contact us online or call one of our practices today to arrange a consultation and get that critical annual skin check.